KNOXVILLE, Tenn. — Tennessee football head coach Butch Jones and seniors Joshua Dobbs and LaTroy Lewis spoke to reporters at Monday’s press conference in the Ray and Lucy Hand Digital Studio. Tennessee (8-4) will play Nebraska (9-3) in the Franklin American Mortgage Music City Bowl on Dec. 30 at Nissan Stadium in Nashville, Tenn. The game will feature a 3:30 p.m. ET kickoff on ESPN. The Vols are ranked No. 21 in the latest College Football Playoff Rankings. The Cornhuskers are No. 21 in the latest Amway Coaches Poll and No. 24 in the latest AP Top 25 Poll. Jones and the players spoke about the Music City Bowl and also about the recent wildfires that have impacted Gatlinburg and other parts of Sevier County. “First and foremost, our thoughts and prayers are with everyone in Gatlinburg and we are looking into doing some different things as a football team in moving forward. The way this state, this community, has embraced them is truly remarkable. From my perspective and our football family, our thoughts and prayers are with everyone associated with that tragedy. “I would personally like to thank Scott Ramsay from the Music City Bowl. I know our players our looking forward to playing in-state with a very, very good opponent. When you look at Nebraska just from the outside, obviously, they sit at 9-3. Two of their losses have come to two top-10 football programs. They started the season off 7-0. Two historical teams, two historical programs that are going to come together; so we are excited about that with a quality opponent and it’s going to be a great challenge in moving forward. “Currently with our football program is our players getting ready to go through final exams. Our staff and myself are in the middle of recruiting. Actually got back in around 4 a.m. this morning, and we’ll head right out after this press conference entering into the beginning stages of bowl preparation. We did practice yesterday. I thought it was a very spirited, competitive practice. These practices are going to be critical for the development of our younger players but also for our seniors. It’s very important these individuals finish their career the right way. “Our time as a football, and Team 120, is very limited but there’s a lot of things we have to get accomplished throughout the course of bowl preparation which will really heat up after this week, heading into the stages of early next week. That’s when we will really start our bowl preparation. Lewis said that the younger players on the team will have an opportunity to continue to improve with this month’s bowl practices. Lewis is part of a UT senior class that has led the Vols to three-straight bowl appearances. Tennessee last played in three-consecutive bowls following the 2002, 2003 and 2004 seasons. Lewis spoke about the importance of finishing the season with a win. Last week, Dobbs, some of his teammates and UT dancers and cheerleaders visited with the people of Gatlinburg who have been affected by the wildfires. The senior quarterback has used his platform to inspire and help others and he and his friends jumped at the opportunity to give back to the community. 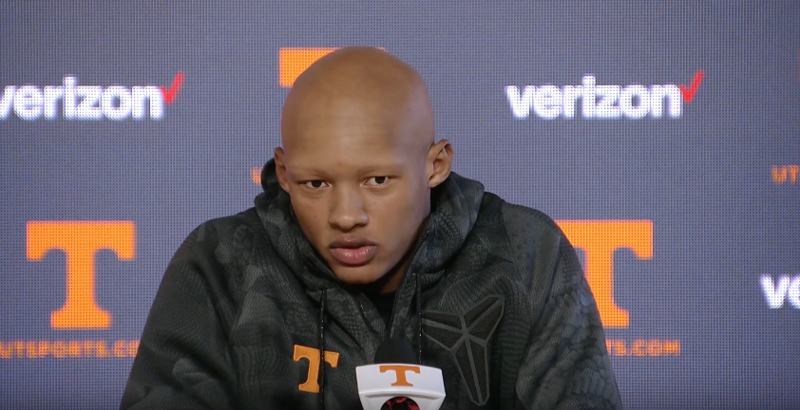 Dobbs and his fellow seniors will suit up one more time for the Big Orange in the Music City Bowl, capping an impressive four-year stretch in which they helped return Tennessee to national prominence.